Even though we only have a few rows of lettuce, spinach, and mustard greens, we ended up with a lot of salad this week! 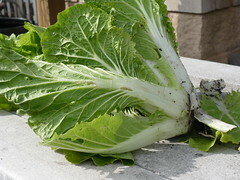 3 small heads of Chinese Cabbage, with the extra bonus of a few slugs and roly polys. 1 bunch of Hon Tsai Tai (Broccoli Raab) I still haven’t gotten around to cooking last week’s bunch! I promise I’ll post a recipe and pictures soon! We harvested the Family of 4 Garden pretty heavily, since I wanted to make sure there was plenty of air flow for the plants. Since we’ve gotten so much rain recently, the leaves were going to start getting slimy and rotten near the soil. Yuck! Posted on May 19, 2010, in Around the Garden, Family of 4 Garden and tagged harvest, herbs, salad greens. Bookmark the permalink. Leave a comment.